Follow along in this new videos series from Bicycle Touring Pro as Darren Alff and Katelyn Miller cycle across western Norway on the self-guided Fjord Cycling Route Bike Tour! My friend Katelyn flew from the Netherlands to join me for a week of cycling in Norway on the Fjord Cycling Route Bike Tour with a local tour company called Berg Fritid. 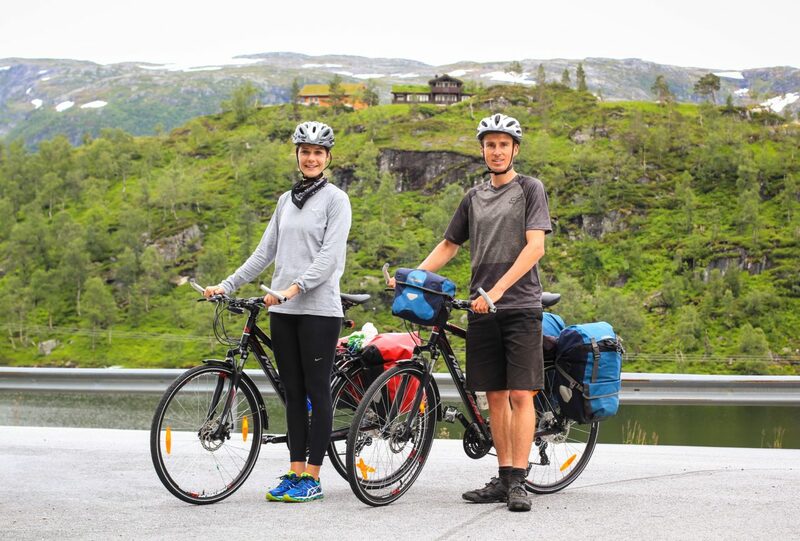 This 6-day self-guided bike tour made it super easy for Katelyn and I to simply show up in Matre, Norway for the start of the tour, jump on a pair of high-quality rental bicycles, and enjoy a week of traveling together in the beautiful fjord/mountain region north of Bergen, Norway. Watch the videos below for a day-by-day recap of our time together on the Fjord Cycling Route Bike Tour. 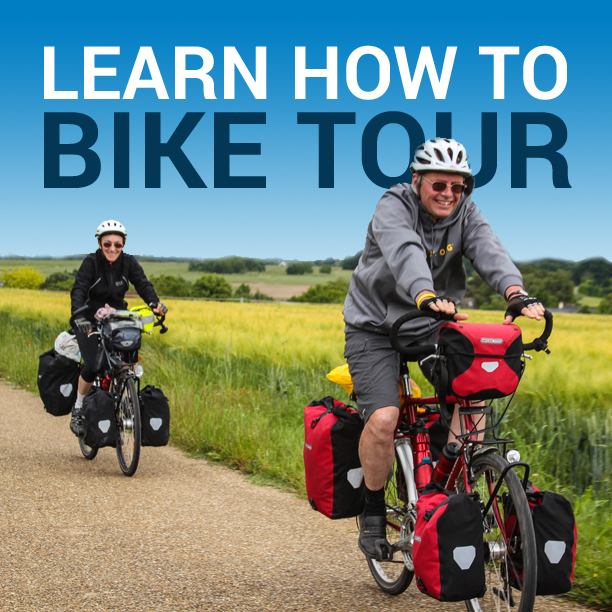 Then, be sure to read Katelyn’s official review of the trip, see the photos from our time together on the tour, and then consider traveling to Norway and participating in the Fjord Cycling Route Bike Tour for yourself. I met Katelyn in Bergen, Norway, where we then jumped on a bus to the nearby city of Matre. Once there, we were met by Arne, the owner of Berg Fritid – the company that organizes everything on the Fjord Cycling Route Bike Tour. Arne equipped Katelyn and I with our bicycles, gave us maps for our trip, and answered any questions we happened to have. Then, we were on our own! After a short look around the Bjorn West Museum in the tiny town of Matre, we cycled east into the mountains, up a short hill, past a large lake, and then checked into a beautiful lakeside hotel where we ate a scrumptious dinner served in the hotel dining room. We had arranged to go mountain biking on day two of the Fjord Cycling Route Bike Tour, so Arne had left a pair of full-suspension mountain bikes for us at the hotel where we were staying. We swapped out our road/touring bicycles for mountain bikes and then headed up into the mountains on the opposite side of the lake. Unfortunately, the weather was not on our side on this particular day – as the rain, wind and snow forced us to abandon our bike ride early. Wet and cold, we rushed back to our hotel, took a hot shower, and then spent the rest of the day indoors – eating food and enjoying the beautiful Norwegian scenery that surrounded us. The third day of the Fjord Cycling Route Bike Tour was probably the best day of the entire bike tour and one of my favorite days of bicycle touring I’ve ever experienced. We began by leaving our lakeside hotel and then cycling up into the nearby mountains to the north. The roads were narrow and free of traffic, with only the occasional cow crossing our path. Passing several small lakes and beautiful, arctic-like scenery, we began a long, downhill descent through several small tunnels and then we finally rolled to a stop along the edge of the Sognefjord – the longest and deepest fjord in all of Norway. The weather in Norway can change quickly. While we were cycling in the rain and cold the day before, the weather on this particular day was absolutely splendid. We spent the day cycling on the southern edge of the Sognefjord – looking for whales and dolphins, deer and elk, eagles and other Norwegian critters all along the way. At the end of the day, we arrived in the tiny inlet town of Eivindvik and checked into the Eivindvik Fjord Hotel, where we were treated to a delicious vegetarian dinner. With our self-guided bike tour almost over, we checked out of the Eivindvik Fjord Hotel, jumped on a ferry boat that took us on a tour of the many nearby islands, and then dropped us off in Mjømna, which is where we started cycling for the day. It was a short bike ride to the town of Frøyset, where we checked into a small farmhouse hotel called the Frøyset Gardsmat. We arrived so early in the day that we decided to go on a little hike up to the top of a nearby mountain. After that, we went on another short bike ride to the edge of a small lake. And after being treated to a delicious lasagna dinner, we took a walk around the village before eventually returning to our room and calling it a night. We didn’t want to leave the Frøyset Gardsmat, but that’s exactly what we had to do on the last day of the Fjord Cycling Route Bike Tour. From there, we shot downhill, along the edge of a nearby fjord, and circled our way back to the tiny town of Matre, Norway – which is where the bike tour began just six days prior. The bike tour was only six days long, but it felt like so much longer (in a good way). We had both loved the experience, enjoyed the scenery, delighted in the people we met throughout our journey, cherished the accommodations we had been blessed with, and were sad that the experience was over. After dropping our bicycles off at the Bjorn West Museum in Matre, Katelyn and I jumped on a bus and traveled back to Bergen, Norway. The following day, Katelyn flew back to the Netherlands and I traveled north for the next leg of my Scandinavian bicycle touring adventure. AUTHOR’S NOTE: If you are interested in participating in the Fjord Cycling Route Bike Tour for yourself, please contact Berg Fritid and tell them you heard about their self-guided bike tour on the Bicycle Touring Pro website. The Fjord Cycling Route Bike Tour is one of the best and least-expensive bicycle tours in all of Norway and it’s a excellent way to spend a week – traveling with a friend, family member or loved one through one of the most beautiful places on the planet. This entry was posted in Bicycle Touring Pro Articles, Darren Alff's Bike Tour Blog, Europe, Featured Articles, Locations, Main Articles, Norway, Videos and tagged berg fritid, cheap norway tours, darren alff, featured, fjord cycling route bike tour, guided tours of norway, inexpensive way to travel in norway, katelyn miller, norway, norway bicycle tour, norway bike tour, norway bike tour reviews, norway bike tour videos, norway travel, norway travel reviews, norway travel videos, self guided tours of norway, self-guided, self-guided bike tour, tours of norway.